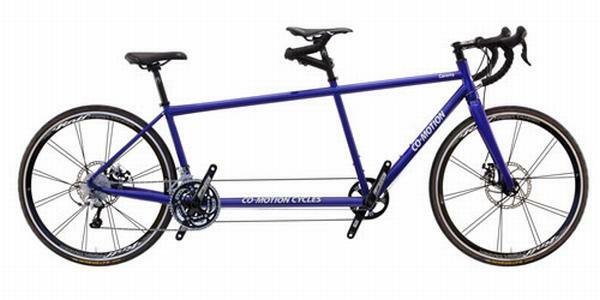 My wife, Deb, and I have had a Co-Motion Speedster tandem for 10 years. In that decade, we have logged about 35,000 miles on the Ferrari red bike. We’ve ridden it in fast pacelines at El Tour de Tucson and local centuries on our western Colorado roads. We undid the S&S couplers, packed the bike in two suitcases and flew to Ohio to ride the Hancock Horizontal Hundred in the heaviest downpour we’ve ever experienced on a bike. We have ridden it in the deserts of Arizona, on the coast of Oregon and in Washington’s rain forests. We’ve mounted small panniers for credit card tours to ski areas. And we’ve done thousands of miles on our favorite training loops. Through it all Big Red has performed flawlessly. So why did we want a new tandem? Although our Speedster was still going strong and the model continues to be made by Co-Motion, we were intrigued by the design and components of a new model and wanted to try out those tempting features. So we ended up with a new Co-Motion Carrera. How is our new ride better than our much-loved Speedster? Disc brakes front and rear. The Speedster had an Avid BB7 mechanical disc on the rear with an Avid V brake on the front. The brakes worked well, stopping the tandem quickly when necessary. But on technical mountain descents, like the tight switchbacks in Colorado National Monument, hard braking with a rim brake can overheat the rim and lead to a blown tire. I avoided this unpleasant outcome with good descending technique — braking hard for each switchback but letting the bike run between corners to cool the rim. Still, it’s a relief to know that the TRP Spyre mechanical discs on both wheels of the Carrera make an overheated rim impossible no matter how gnarly the descent. Also, the Avid brakes had one fixed and one moveable pad, leading to set-up problems and ear-splitting shrieks — especially in the rain. The TRP Spyres move both pads simultaneously toward the rotor, eliminating those problems. The rotors measure 203mm for better heat dissipation and stopping power. Patrick at Tandem Cycle Works, where we bought both the old and new bikes, mentioned that the TRP rotors were extensively drilled out to dump heat better. However, the perforations made a maddening noise as they rolled through the pads during hard braking. On his recommendation, I replaced the front rotor with an Avid model, which reduced the whirring considerably. No diagonal tube. The Speedster used a time-tested tandem frame design with a long diagonal tube for added stiffness. This was necessary with the relatively flexible tubing used at the time. You don’t want a tandem that’s a flexible flyer on tight switchbacks. But the diagonal tube added weight and made bottle cage placement problematic. It also necessitated six S&S couplers, adding more weight and complexity when disassembling the bike for travel. The Carrera can dispense with the diagonal tube due to advances in tube stiffness. It uses Reynolds 631 zonally butted tandem tubing, not only saving the weight of the diagonal but also eliminating two of the S&S couplers. Bottle placement is more akin to that on a single bike. Visually, the lines of the frame are more open. As a bonus, both cleaning and packing the bike are easier. RELATED ARTICLE Are You a NBC (Natural Born Climber), or Not? Gates belt drive. Traditional tandems have a timing chain linking the two cranks. This necessitates using most of two regular chains to bridge the space. The Carrera uses new technology in the form of a Gates carbon belt drive. I like not having to piece chains together or lube the timing chain. We haul our tandem in the back of our car (see below), and one less greasy chain is an advantage. The belt is impervious to moisture, too. On a long tour away from civilization, chains are a lot easier to find than new belts if something goes wrong. But the Gates has a great record for longevity, so it should be plenty tough in most applications. The Gates belt needs much more tension than a chain, and the tension must be set within fairly narrow limits. There are simple tools to get it right and even an iPhone app to help. An overly tight timing chain is a notorious wrecker of bottom brackets, but we haven’t logged enough miles to see if the tightly-tensioned Gates belt leads to premature wear on this component. Lighter weight. The Speedster, outfitted ready to ride with pedals, saddles, pump, rear flashing light and large seat bag on a small rear rack weighs in at approximately 45 pounds. The Carrera, similarly equipped, registers only about 37 pounds. I’m not a weight fanatic, but we can definitely feel the difference on long climbs as well as on short,steep walls. And when we have to hoist the bike, 8 fewer pounds helps save energy best used for pedaling. Lively handling. Buying a new bike is always an act of faith when it concerns handling. How will it corner? Will it be stable on descents? I liked the Speedster because it went around corners predictably and was rock solid even at over 50 mph on mountain downhills. But the Carrera doesn’t disappoint. Cornering is a tad quicker, more like a good racing bike, but the downhill stability is just as impressive, even in crosswinds. It is equally stable when standing on steep hills. Ten-speed drivetrain. The Speedster had a 9-speed Shimano Ultegra triple drivetrain (with Race Face cranks) which was state-of-the-art in 2004. The Carrera sports an Ultegra 10-speed. I like the additional cog in the back for smaller gaps between gears. I was concerned that the 10-speed chain might be more fragile, but so far there have been no problems. A more compact design. The Speedster fits, with an inch or two to spare, in the back of our 2003 Toyota Highlander. I lower the rear seat, remove the front wheel from the tandem, turn the handlebars and slide it in diagonally. It’s tight, but it works. However, the Speedster doesn’t fit in our 2008 Toyota RAV 4. So it was a surprise to see that not only did the Carrera slip into the Highlander more easily, it fit in the RAV 4, too. I attribute this to the absence of the diagonal tube, making it easier to shorten the bike by turning the bars. The bike isn’t cramped though; it has plenty of stoker room and enough front-center measurement that toe overlap isn’t a problem even with fenders. I know that the Carrera was expensive but we look at it this way: we will save at least 30 grand not having to buy a new car when the Highlander conks out! RELATED ARTICLE Is It Normal for Steep Climbs to Get Harder as I Age? Thudbuster stoker seat post. Stoker comfort is paramount on a tandem, and Deb reports a cushy ride on the Thudbuster post, especially on our legendarily bad western Colorado pavement. Tandem and disc-specific Co-Motion T390 tapered fork. This is one beefy fork. But extra heft is required with disc brakes since the braking force is applied at the axle rather than at the fork crown. I don’t notice that the added stiffness detracts from my hand comfort, and it is welcome in tight corners. It’s complemented by a Chris King headset. Fender and rack eyelets front and rear. This makes it easy to mount fenders for the rain and racks for touring. We don’t plan on fully loaded touring, but for short credit card jaunts, the bike will be easy to outfit with small panniers. Rolf tandem wheels. They are sleek, fast and their medium-depth rim is stable in crosswinds. We’ve had no problems so far, a good thing because the instructions say that “wheel truing requires special tools and knowledge and should be performed by a qualified professional mechanic. Should you suspect your wheels need truing…take them to your Rolf Prima dealer for evaluation.” That wouldn’t be great news on a tour miles away from a bike shop. And even if you’re a qualified wheel builder, the tires (Continental 28mm Gatorskins) need to be taken off to do any truing work. Striking blue-to-silver fade paint. The Speedster was Ferrari Red, and red bikes — it’s an indisputable fact — are faster. But we went with the blue-to-silver fade as more appropriate, especially the silver, for this tandem couple with a combined age of 136. Just as with the Speedster, we fully expect to get at least 10 years of riding pleasure out of the Carrera. Highly recommended! His newest eArticle, launched last week, focuses on “the idea that if you can identify dozens of very small improvements, each insignificant by itself, the combination of those miniscule gains would translate into a major overall improvement in performance. Let that sink in for a minute: Instead of slavishly working on one big improvement at a time (the normal m.o. of roadies), we could instead – and without a whole lot of effort – tick off a dozen or so smaller improvements that, taken together, can make a sizable overall impact on our cycling. RELATED ARTICLE When In Doubt, Stop Pedaling! These proved to be topics of interest to RBR readers, as well over 900 of you voted on the Pedal-Cleat question, and over 800 weighed in on your normal tire inflation approach. Fully 88% of RBR readers use one of three main pedal-cleat systems – including 41% who use a 3-hole type (SPD-SL, LOOK or similar), 27% who use a recessed system (SPD walkable, MTB or other) and 20% who use the Speedplay lollipop type. As for your normal tire inflation approach, your habits are all over the map. First off, 57% of you air up before every ride, while the other 43% air up every few rides. 22% — I air up before every ride: to 90-100 PSI. 16% — I air up before every ride: to 100-110 PSI. 15% — I air up every few rides: to 90-100 PSI. 13% — I air up every few rides: to 100-110 PSI. 11% — I air up before every ride: to 110-120 PSI. So, the pressure sweet spot for RBR readers is 90-100 PSI, with 37% of you choosing this range. Next most common is 100-110 PSI, with 29% of you choosing this range. 80-90 PSI got only 11% of the votes, while our low-pressure readers (less than 80 PSI), with 4%, edged out our high-pressure cohort (120-plus PSI), with 3%. What Type of Pedal-Cleat System Do You Use? What’s Your Normal Tire Inflation Approach? I air up before every ride: to 120-plus PSI. I air up before every ride: to 110-120 PSI. I air up before every ride: to 100-110 PSI. I air up before every ride: to 90-100 PSI. I air up before every ride: to 80-90 PSI. I air up before every ride: to less than 80 PSI. I air up every few rides: to 120-plus PSI. I air up every few rides: to 110-120 PSI. I air up every few rides: to 100-110 PSI. I air up every few rides: to 90-100 PSI. I air up every few rides: to 80-90 PSI. I air up every few rides: to less than 80 PSI. Here’s a cautionary tale for any of you who pack heat while riding. Two weeks ago, St. Petersburg, Florida, resident Troy Earle Smith Jr., 25, accidentally shot and killed himself while riding his bike. According to an AP story recounting the event, detectives were able to piece together what happened after Smith was found with a gunshot wound to his chest. Police spoke with witnesses and reviewed security video from businesses nearby and surmised that the handgun Smith had in his jacket pocket discharged, fatally wounding him.